Rai Chen System Technology Inc.
During planning, the management of the Center commissioned Rai Chen System Technology Inc., a highly experienced and professional content integration firm, to directly leverage the vendor’s extensive hardware planning, integration, and consultation capabilities. 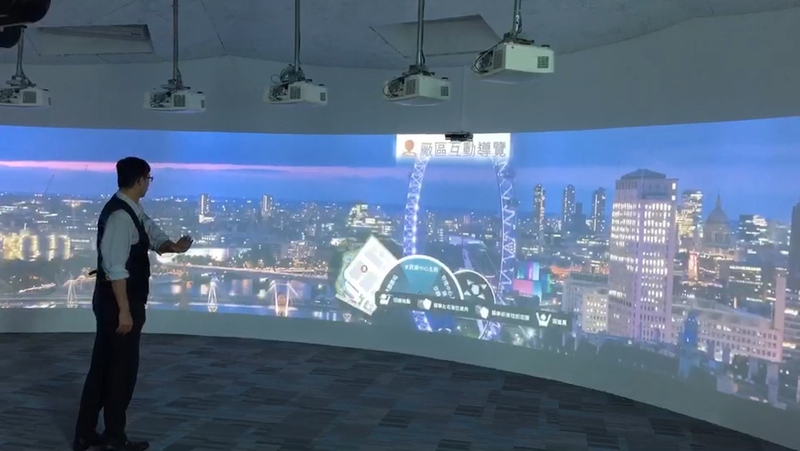 A system engineering team from Optoma, the original manufacturer of projector solutions, was also part of the project for their extensive experience in blending complex, curved surface projection systems. The team provided a customized design plan, consultation services, and system installation services. Client requirements for this project: An 11-meter wide curved interactive projection wall for the central door surface. Make use of technology and an interesting animation script to attract the attention of visitors and the public, providing an educational and entertaining experience that helps children and youths appreciate the importance of water resources. An on-site survey revealed that the site is a polygonal glass house that poses a significant challenge due to interference from strong, ambient lighting. The 11-meter curved surface requires edge blending of at least five connected panels and provided with high illuminance projectors. The client also requires the site, when viewed outside, to appear like an unshaded glass house. In other words, the curved projection system in the site cannot interfere with the overall landscaping and design. Another requirement would be functions that provide site visitors with an interactive experience of the water resource treatment processes. After accepting the client’s requirements, the engineering team requested permission to conduct an on-site survey. Plans were made, according to the site areas and requirements of the venue owner, to create a curved projection wall with edge blending of five connected panels with backlighting function placed in front of an internal glass wall surface. High illuminance, high-end short-throw projectors X605, Kinect interaction sensors, and GB200 image blending processors were used to create the interactive projection system. The device server and blending processors are both hidden within the inner side of the ceiling to prevent visual interference and achieve aesthetic consistency of the interactive projection venue. 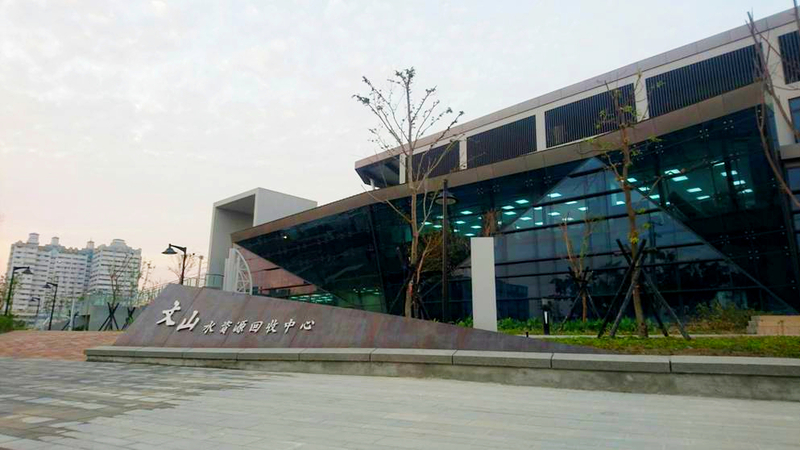 The Wenshan Water Resources Plant is a public agency and facility capable of processing 29,000 cubic meters of sewage every day, helping to improve environmental sanitation and quality of the Xitun and Nantun districts west of Fazi River. The Center also reduces river pollution and improves sewerage connection in Taichung City. The 11-meter wide, 2-meter tall curved, interactive projection wall has been specifically installed in Station 1 to display to the public the efficient water resource treatment and recycling process used by the Center. The latest projection technologies and an interesting storyline were used to describe the process, encouraging visitors to experience the treatment first-hand and providing an educational and entertaining experience that help children and youths appreciate the importance of water resources.